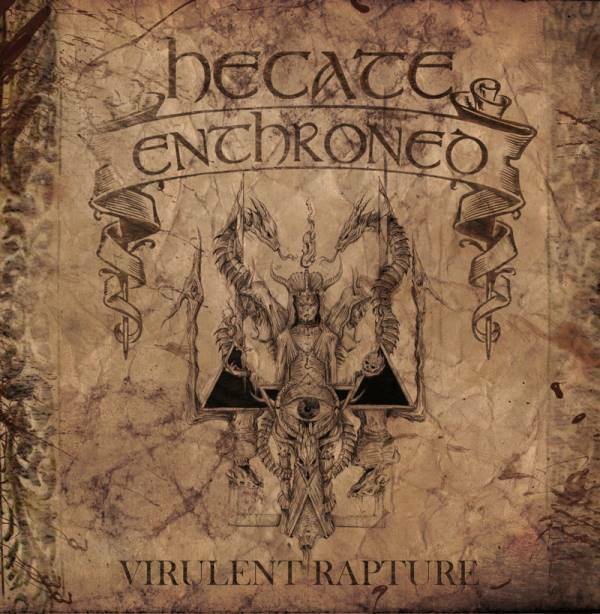 Music Review: Hecate Enthroned – Virulent Rapture | Mehta Kya Kehta? I first heard Hecate Enthroned years ago when I was starting out as a musician who was becoming increasingly attracted to the more extreme side of metal. The band was interesting back then, and Upon Promethean Shores (Unscriptured Waters), the album I gave those listens to, would at the most be a fun listen now. 2014 fast coming to an end, I couldn’t not listen to Hecate Enthroned‘s latest album and looked forward to the cheesiness and to seeing how this band from my early times had grown. ‘Thrones of Shadow’ begins with a typical symphonic Black Metal intro (this is never a complaint from me; ‘typical’ is just fine if done correctly), and to my utter disbelief George Fisher’s growls emanate from the speakers along with the opening riff which is out-and-out OSDM, and the song is then made to go Black Metal, synths and screams. This is Hecate Enthroned wanting to stay Black Metal, but influences have strange ways of revealing themselves and the desire to do new things rarely remains hidden. The odd Thrash Metal riff here, and another OSDM riff there, but it’s largely the Corpsegrinder-style growling that’s out of place in this setting. Virulent Rapture is defiantly Black Metal for most part, though – agreeable because of its kosher approach to (cheesy) Black Metal – and it’s the Black Metal sections that delight. Listen to the title track and you’ll mistake it for a Cannibal Corpse song. So here’s the problem: I love Cannibal Corpse, but I don’t want a Black Metal (or Death Metal) band to sound exactly like another band. It’s cool that Hecate Enthroned can do it (because of the vocalist), but this is the kind of blunder that robs a band of its true identity. Virulent Rapture could have been a terribly enchanting album from Hecate Enthroned.